Crystal habit Varies with locality. Terminated tabular hexagonal prisms. 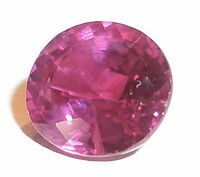 Pink sapphire Caused by a color impurity and makes the stone appear pink. The ruby (from the Latin word ruber, meaning "red," or rubeus, meaning "reddish") is a well-known red gemstone. It is considered one of the four most precious types of gems, the other three being diamond, emerald, and sapphire. In chemical and mineralogical terms, the ruby is a variety of the mineral corundum (aluminum oxide), with the red color produced mainly by the presence of small amounts of chromium. The non-red varieties of gem-quality corundum are called sapphires. Natural rubies are exceptionally rare, but synthetic rubies (sometimes called "created rubies") can be manufactured fairly inexpensively. A synthetic ruby crystal was used to create the first laser. Although rubies adorn the crowns of kings and symbolize wealth and luxury, it needs to be remembered that these gemstones (as well as others) were recovered by the hard labor of miners working under difficult circumstances, often placing their lives in danger. In addition, wars have been fought and thefts have been committed in attempts to acquire these precious stones. Rubies (as well as sapphires) can be found in various rocks, mainly those of igneous or metamorphic origin (Sethi, 1997). In addition, through the weathering of gem-bearing sedimentary rocks, these minerals are found in the form of "placer deposits" at streams and rivers. For instance, in the Mogok region of Myanmar (Burma), the mines are located in the alluvial valleys of rivers. Most rubies have been found in Myanmar, Sri Lanka (Ceylon), Kenya, Madagascar, and Thailand. They have also been mined in Australia and Greenland. In the United States, they have been found in Montana, North Carolina, and South Carolina. The Mogok Valley in Myanmar is well-known for having produced some of the finest rubies. In recent years, however, very few good rubies have been found there. Other ruby-producing areas of Myanmar are Mong Hsu and Nam Ya. It is said that the British annexation of Burma in 1886 was motivated in large part by their desire to control the ruby mines there. In 2002 rubies were found in the Waseges River area of Kenya. In addition, rubies are being mined at Audilamena in northeastern Madagascar. Sometimes, red spinels are found in the same rocks as rubies and are mistaken for the latter. Nonetheless, fine red spinels may approach the average ruby in value. Exploring a pit mine for rubies can be a dangerous occupation. If appropriate safeguards are not used, the mine could collapse while the workers are underground. Also, as the workers dig deeper, air becomes increasingly scarce, leading to the possibility of suffocation. Rubies have a hardness of 9.0 on the Mohs scale of mineral hardness. Among the natural gems, only diamond is harder. All natural rubies have imperfections in them, including color impurities and inclusions of rutile needles known as "silk." The absence of silk in the stone indicates that the stone was heated to a temperature of up to 1800 °C in an oven, to enhance the red of the ruby. Today, about 90 percent of all rubies are heated. Usually, the rough stone is heated before cutting. Rubies that are not heated are considered unusual. Some rubies undergo a process of low tube heat—that is, the stone is heated over charcoal at a temperature of about 1300 °C for 20 to 30 minutes. The silk is partially broken and the color is improved. Rubies occasionally show an internal, star-like formation called asterism, when cut into a cabochon. These are called "star rubies" and, because asterism is rare, they can be more valuable than regular rubies. On rare occasions, rubies show color change and chatoyancy—an optical reflectance that arises from the material's fibrous structure or from fibrous inclusions or cavities in the stone. Synthetic rubies have been made since the late nineteenth century. They have become more common since the work of Auguste Verneuil and the introduction of the flame fusion process. They can also be produced by other methods, such as the Pulling process, flux process, and hydrothermal process. Most synthetic rubies are produced by flame fusion, because of the low costs involved. Synthetic rubies may have no imperfections visible to the naked eye but magnification may reveal curved striae and gas bubbles. The fewer and less obvious the imperfections, the more valuable the ruby is. If, however, there are no imperfections (i.e., a "perfect" ruby), the ruby will be suspected of being artificial. Dopants are added to some manufactured rubies so they can be identified as synthetic, but most need gemological testing to determine their origin. Imitation rubies have also been present in the gemstone market for some time. Red spinel, red garnet, and even glass have been falsely named as rubies. Trade terms such as balas ruby for red spinel and rubellite for red tourmaline can mislead unsuspecting buyers. Such terms are therefore discouraged from being used by many gemological associations, including the Gemological Institute of America (GIA). Most synthetic rubies can be identified only by using a microscope or loupe with at least a 10x magnification, or with a light source, such as a lamp or penlight. 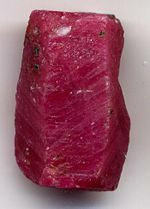 Occasionally, a technique relying on fluorescence is used to differentiate between a synthetic ruby and a natural one. may also show included gas bubbles. may have wavy, fingerprint-like inclusions. Ruby gemstones are valued according to a combination of various features, including their size, color, clarity, and cut. A stone is not valued based on its size alone. For instance, although pieces of red corundum weighing many kilograms can be found, their color and clarity are generally not of sufficient quality to make them valuable as gemstones. A stone's value is often gauged from its auction prices. As of 2006, the record price paid at auction for a single stone was $5,860,000 for an unnamed 38.12 carat cabochon-cut ruby. However, other stones with potentially greater value may never have been sold at auction. In some early cultures, the ruby was considered a protective agent and a remedy for diseases of the heart, blood, and digestive system. Today, the ruby continues to be regarded as a symbol for passionate love. In addition, it is the birthstone associated with the month of July. Among precious stones, the ruby is the one most often named in the Bible. For example, Proverbs 31:10 states, "Who can find a virtuous woman? for her price is far above rubies." According to Rebbenu Bachya, the word odem in the book of Exodus, verse 28:17, means "ruby". It was the stone on the Ephod representing the tribe of Reuben. Modern Hebrew has taken this meaning. In ancient India, certain gems were thought to possess supernatural powers and were associated with different planets. In the case of the ruby, considered the Lord of Gems, it was associated with the Sun, the lord of all the planets. In addition, in Hindu mythology, the ruby was the preferred gemstone used as an offering to Lord Krishna. The famous lighted "Red Stars" mounted above the Kremlin spires, once thought to be giant rubies mined in Siberia, are actually colored glass. The Kremlin stars are the five-pointed red stars installed in the 1930s on five towers of the Kremlin, replacing gilded eagles that symbolized Imperial Russia. Although their names bear some similarity, rubies are not related to the chemical element rubidium and do not contain rubidium. Both names derive from the same Latin word, ruber, describing their reddish color. ↑ PROJECT underGROUND Vital Statistics: Ruby Mining Facts. Drillbits & Tailings: February 7, 1999. Retrieved March 19, 2007. ↑ A cabochon is a gemstone that has been shaped and polished but not faceted. It usually has a convex top and a flat base. ↑ Hughes, Richard Ruby & Sapphire, Judging Quality, Prices, Spinel, Part 5. Retrieved March 19, 2007. ↑ Matsen, Sher. "The History of Rubies." Retrieved March 19, 2007. Sethi, Parvinder S. "Nature’s Perfect Imperfections." The World & I (Dec. 1997): 186. Available online at worldandi.com. This page was last modified on 20 July 2015, at 21:27.